An All-American diver, Marshall Wayne competed for Miami from 1931 to 1934. Wayne was a self-made diver who never had a coach and corrected his form when others pointed out his faults. 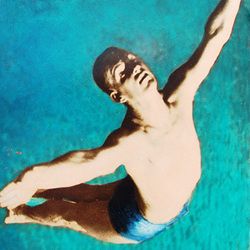 Despite being considered too tall (6'1") for diving's intricate aerial acrobatics, Wayne became one of the more successful collegiate divers and was included on "The best American Men Swimmers of 1935" list with his No. 2 ranking in 3-meter springboard and 10-meter platform competitions. The next year, Wayne competed in 1936 Summer Olympics in Berlin and won a Gold Medal in the 10-meter platform and a Silver Medal on the 3-meter springboard. The former World War II Lieutenant Colonel and Pan American pilot is a member of the International Swimming Hall of Fame. Wayne is retired and current;y resides in Hendersonville, NC.